"Line balancing is the technique of balancing the unbalanced production line so that the idle time of machines in the assembly line get reduced which in turn result in reduced overall cycle time in making of a product." 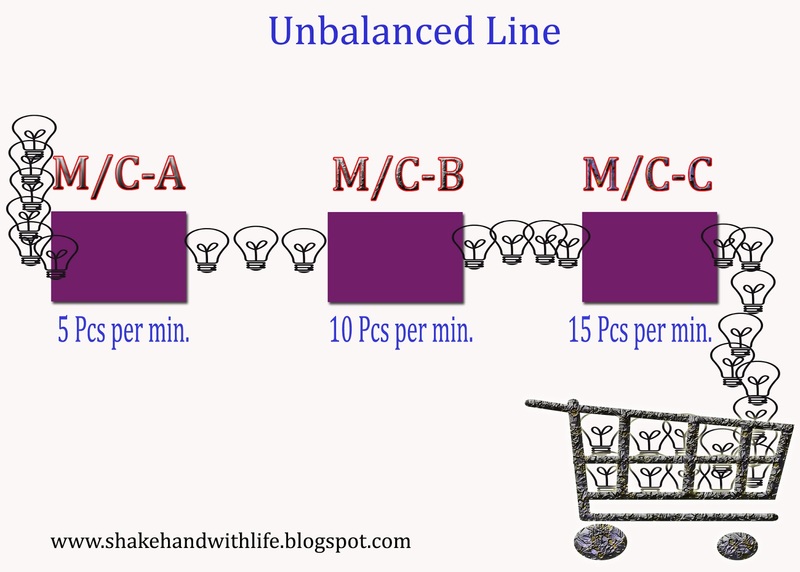 "The main object of the line balancing is to distribute the tasks evenly over the work stations so that idle time of men and machines is minimised." "Line balancing aims at grouping the facilities (or tasks) and workers in an efficient pattern in order to obtain an optimum or most efficient balance of the capacities and flows of the production or assembly processes. Tasks are grouped so that their total time is preferably equal to or a little lesser than the time available at each work station , this reduces the idle time and in turn overall cycle time." Suppose there are three machines or work stations, A, B, C which can process 5 , 10, and 15 pieces per unit time respectively and the sequence of operations is such that the pieces flow from machine A to B and from B to C.
Since, A has minimum capacity i.e. of processing only 5 pieces per unit time , naturally work station or machine B will remain idle for 50% of its time and machine C for 66.66% if its time. It shows that the line is unbalanced. 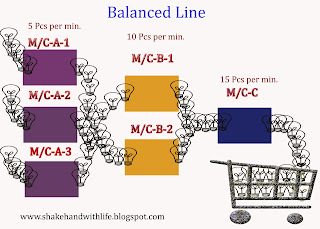 One way to practically balance the line is to have three machines of type A, 2 of type B and with every machine of type C ; another approach to balance the line will be to give some other task to machines B and C so that they do not remain idle. 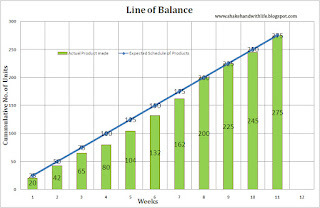 "Line of balance (LOB) is a manual planning and scheduling technique. It is utilized in determining production progress in terms of percent of task completion." To identify those operations in which progress is unsatisfactory. LOB technique is an example of management by exception since it deals only with the important or crucial (exceptional) operations in a job, establishes a schedule (or plan) for them and attracts attention to those which do not confirm to this schedule. It is particularly useful where large batches of fairly complex items requiring many operations, are to be completed /delivered over a period of time. LOB technique consists of five main stages , all utilizing graphic aids. A graphical representation of the delivery objective. A chart of production programme showing the sequence and duration of all activities required to produce a product. A progress chart of the current status of component completion. 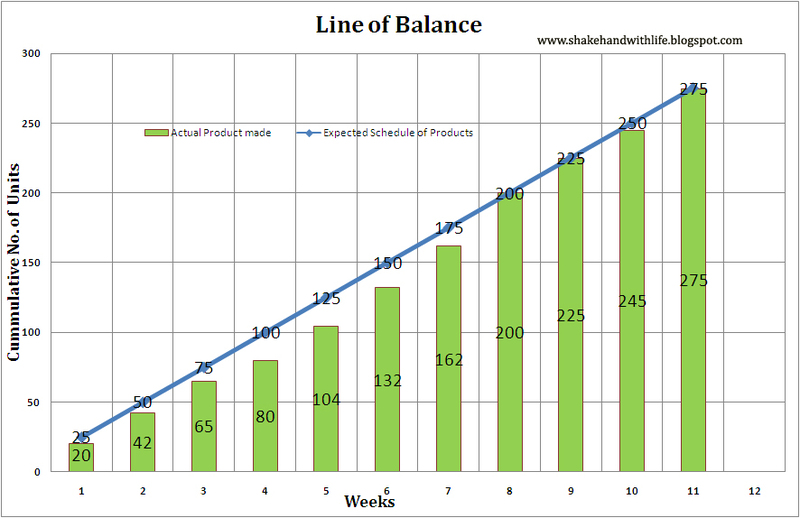 A line of balance drawn to show the relationship of component progress to the output needed to meet the delivery schedule. Ref. Book : Industrial engineering and Production Management , by M. Mahajan, Publisher Dhanpat Rai and Co.
Nice explanation of Line Balancing. Make-times on each work station should, after they have been balanced, equal TAKT time. TAKT time is the average time between customer orders. If perfect balance can be obtained so that Make-Times are equal and are equal to TAKT Time then inventories will be minimised. Very simple & hence nice explaination. 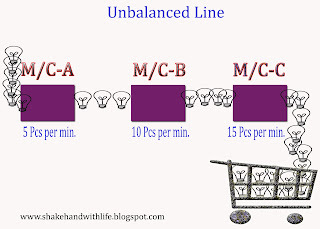 When the line balancing is done Line of Balance need to be monitored for efficency.